Governments seem to be getting poor reviews around much of the globe. In Western and non-Western nations, in the Global South and the Global North, disillusionment with politicians is widespread. Anti-establishment parties are on the rise in many European nations, and Donald Trump’s victory in the US presidential race has dramatically highlighted a broad discontent with the status quo in American politics. And, as our surveys at the Pew Research Center have shown, there is also considerable discontent with the way the political system is working in emerging and developing nations as well. Part of the problem is that people believe their political leaders are out of touch, listening to the few rather than the many. In eight of nine countries we recently polled, more than half said government is run for the benefit of only a few groups in society, not for all people. This finding echoes complaints regularly heard in the US and Europe about distant elites in Washington and Brussels, or the frustration many feel in middle and lower income nations about corrupt officials in their capital cities. Still, despite their displeasure with political leaders, people haven’t given up on democracy or their ability to make their voices heard. In our survey, roughly half or more of respondents in eight nations – Kenya, Nigeria, South Africa, the US, India, Greece, Italy and Poland – said ordinary citizens can exert meaningful influence on national-level governments. Hungarians were the lone pessimists: 61% said average citizens can do little to affect their country’s government. So what type of activities do people in Europe, Africa, South Asia and North America have in mind when it comes to their ability to influence national politics? The survey sought an answer by asking respondents about the types of political engagement they have participated in, as well as the kinds of issues that could motivate them to get involved politically. Unsurprisingly, voting is the most common political activity, but considerable numbers also said they have attended a campaign event, participated in a volunteer organization, or joined an organized protest. And for some, online platforms are an important new civic space. Small but notable minorities across these nine countries have shared political views on the internet, encouraged others to become politically active online, or signed an online petition. These new forms of engagement are especially popular among younger people. For instance, a quarter or more of 18-34 year-olds in the US, Italy, Greece, South Africa, and Nigeria have posted their thoughts about political or social issues online. While internet access and mobile technology have created new modes of civic engagement, it is less clear that these innovations have mobilized a broader segment of the public. Our surveys find that many people who are politically active online are not newcomers, but veterans of offline political activities. If someone has participated in a traditional form of political participation – for instance, attending a campaign event – that person is also generally more likely than others to engage in online political activities, such as posting their views about politics. 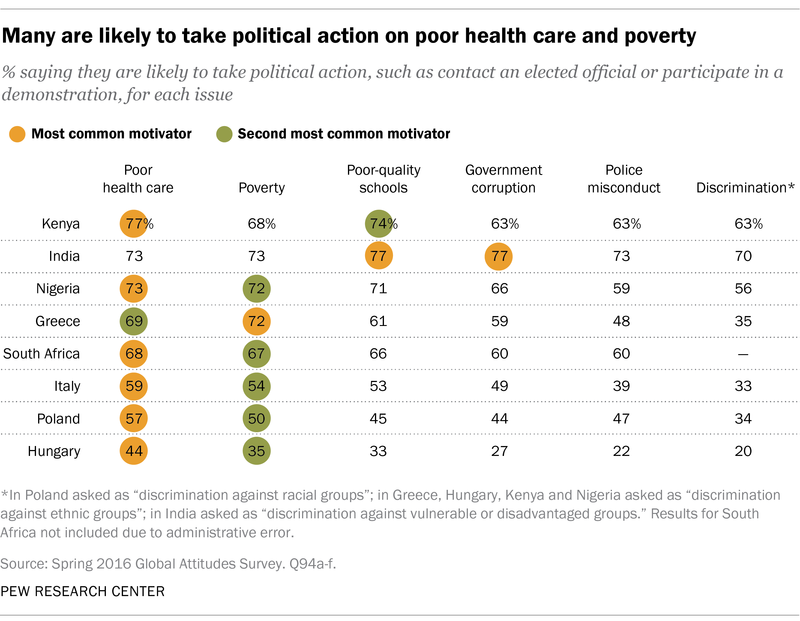 When asked what issues could get them to take political action, such as contacting an elected official or taking part in a protest, poor healthcare is the top choice in six of eight nations surveyed. Among the six issues tested, poverty and poor-quality schools are also cited by many. These findings suggest there is perhaps more latent potential for civic engagement around the world than many people believe. Despite their strong grievances about how government is currently working, most of those we surveyed believe ordinary citizens have the power to sway government towards the public’s will. Moreover, they mention specific issues that might provoke them to take action. Challenges like inadequate healthcare, poverty and poorly performing educational systems – issues that have a deep impact on people’s lives – could push them into the voting booth, or perhaps the streets, to hold those out of touch politicians accountable.